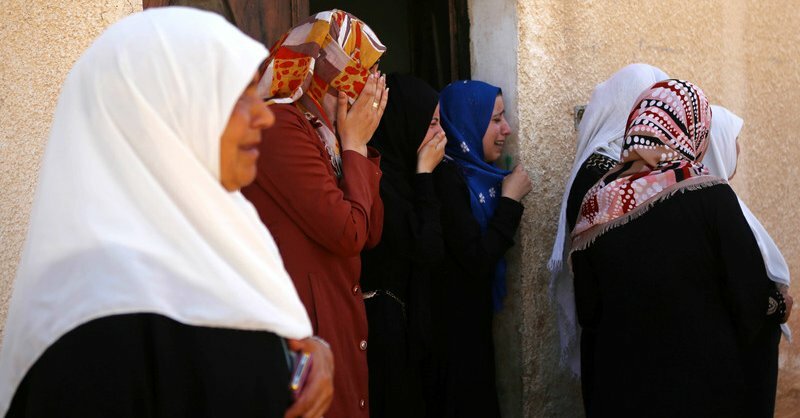 A day after her death in an Israeli hospital from wounds sustained when Israeli settlers firebombed her family home just over a month ago, Reham Dawabsha’s funeral was held in her village south of Nablus, in the northern part of the West Bank on Monday.Reham Dawabsha was 27, having just marked her birthday on September 5th, hours before she died. Her baby, Ali Saad Dawabsha, was burnt to death during the Israeli terrorist attack by right-wing Israeli settlers on July 30th. Reham’s husband, Saad, and 4-year old son, Ahmad, were also severely burned all over their bodies. Her husband succumbed to his wounds on August 8th, the couple’s wedding anniversary. Now 4-year old Ahmad is the only member of the family left alive. 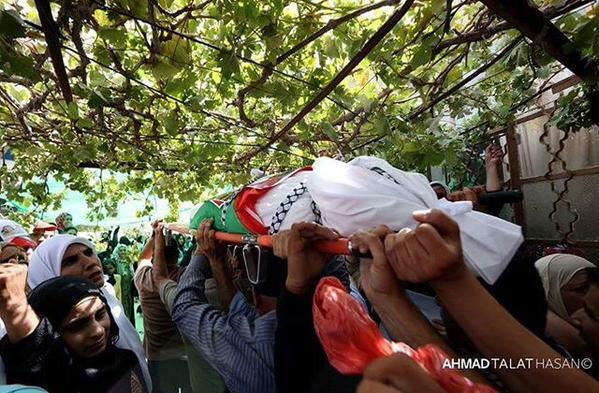 He remains in critical condition in an Israeli hospital, having suffered from third degree burns on 60% of his body. Thousands of Palestinians gathered at the entrance to Douma village, south of the city of Nablus, on Monday, to mourn for Reham Dawabsha. According to reporter Alison Deger from Mondoweiss, on Saturday, while receiving treatment at Tel Hashomer hospital, the largest medical facility in the Middle East, an infection in grafted skin spread throughout Riham’s body. Her organs began shutting down, according to her brother-in-law Nasser Dawabshe. Hospital staff then notified Riham’s family of her deteriorating condition, and assisted in arranging travel permits for the West Bank relatives into Israel. But by the time they arrived, it was too late. Reham had succumbed to her wounds, joining her baby and husband in death. At the funeral on Monday, many students from the school where Reham worked as a math teacher marched in the funeral procession, along with her fellow teachers and staff. Numerous Palestinian public officials made statements, including legislators, cabinet members and the Governor of the Nablus District, Akram al-Rujoub. the death of Reham Dawabsha on the eve of her 27th birthday…Reham is the third victim of the 31 July terrorist attack in Douma village which killed her husband and infant son, and wounded her four-year old son Ahmed. concerned by the lack of progress in identifying and prosecuting the perpetrators of this outrage. Israeli authorities say they have been ‘unable to solve’ the murder of the three members of the Dawabsha family by right-wing Israeli extremists, despite the fact that Palestinian residents of the village saw four men run from the house after setting it on fire, and returning to the nearby illegal Israeli settlement. No one has been charged with the crime – several right-wing extremist leaders were brought in for questioning, but were released soon after. None were from the nearby illegal Israeli settlement where the eyewitnesses saw the men run to after perpetrating the attack.